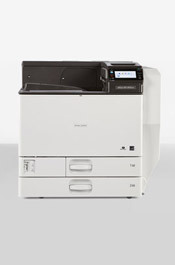 The SP 8300DN is a workhorse black-and-white laser printer with an output speed of 50 A4 pages per minute. It's versatile and can handle paper up to A3 in size and 216 gsm in weight. The highly productive Aficio™SP C340DN prints 25 colour and black-and-white pages per minute, with no loss of speed when printing in duplex mode for double sided output. Paper up to 220gsm as well as envelopes, labels, card stock and Banners can be printed on by this versatile colour laser printer. 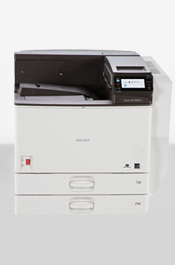 The SP C831DN is an A3 colour laser printer with an output speed of 55 A4 pages per minute making it a highly productive solution for departmental use. 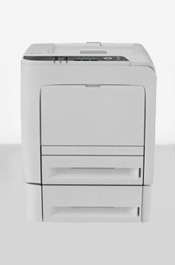 With optional Wi-Fi connectivity the SP C831DN can be located anywhere in the office for flexibility and convenience. 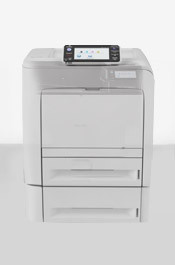 Combining exceptional efficiency and intuitive colour-printing, the SP C342DN A4 colour printer is easy to use, offers low running costs and superb output capabilities – making it ideal for almost any small to medium sized office or business.